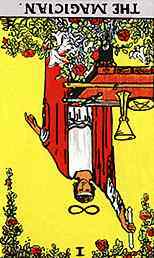 Symbolizes the self-awareness, the ability with the written or spoken word, love new ideas and the willingness to take risks. Also it involves the orientation of hidden forces, truculence and misuse of occult powers. 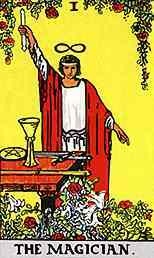 The magician means originality, initiative, center of action, spontaneous intelligence. Also self-possession, autonomy, emancipation from prejudice, eloquence, skill, ability, finesse, diplomacy. Its related professions are lawyers, orator, diplomat or politician. These can be falsehood, anxiety, deception, fraud Faith, negative magic, the fear of change and illusion. It means Unscrupulous, careerist, intriguing, liar, crook, swindler, charlatan. Indecision, ineptitude, weak-willed, delay, uncertainty. Will applied to evil ends.